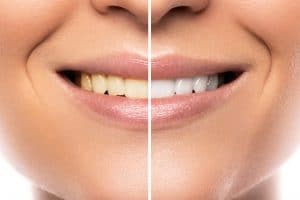 Quiz: How Does Teeth Whitening Work? Do you want to obtain a brighter smile before your next party or summer event? We can help with professional teeth whitening. Unlike store bought options, these offer more dramatic (and longer lasting) results. Which option will be right for your smile? True or False: We can remove stains in one visit. True or False: You can brighten your smile from home. True or False: There are ways to help your new results last longer. True. We have an in-office procedure that can remove stains in a single sitting. We first place a protective covering over the teeth and gums. Next, we apply a powerful bleaching gel. We then activate the gel using a curing light, which then breaks up and stains and removes them. True. We can also offer a home-based solution. We create a set of custom-made trays, which we send home with the patient. We also prescribe a bleaching gel. Each day, the patient will fill the trays with the gel and then wear them for around a half hour to 45 minutes. For optimal results, total treatment time may take between one and two weeks. Patients often see their smiles brightened by multiple shades and we can address minor and severe discoloration. True. First, you can keep the trays and remaining gel for touch-ups down the road. You can also cut back on drinks with dark pigments, such as eta, red wine, soda, and coffee. You can also eat fewer sugary food items as well, as these promote plaque buildup and make stains more apparent. You should also brush your teeth twice a day, floss every night before going to bed, and see your dentist every six months for a checkup and dental cleaning. If you have any questions about teeth whitening, then contact our team today. We can help you enjoy a smile free of unsightly discoloration. We proudly serve patients from Breaux Bridge, Broussard, Scott, Youngsville, and surrounding communities. To schedule a consultation, contact us at our Lafayette, LA, dentist’s office at 337-237-6453.